The unique shade of off-white applied with Viscose lining inside. Stylish Snap tab moto collar with smooth YKK zipper closures makes it comfy. Two flap pockets and Two hand pockets to keep your stuff safely. The minute I put in my request, I was excited. My brain was unendingly thinking when it will reach. In spite of the fact that it took long, The jacket I got is great and well adapted shape. The client service apologizes for the delay. I hope the service would be better next time. It’s worth buying this jacket. Despite the fact that white clothes need high maintenance since the light color gets dirty very quickly. I’m loving it. Tobey Marshal Jacket is going to add stylish aggression in your persona. 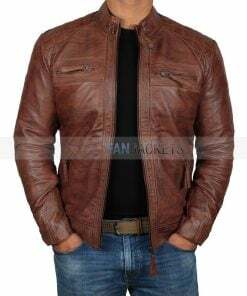 The Need For Speed Jacket is made from PU Leather. The outline and surface of this exceptional Aaron paul Jacket made it a perfect accumulation. It looks marvelous on you as party wear. 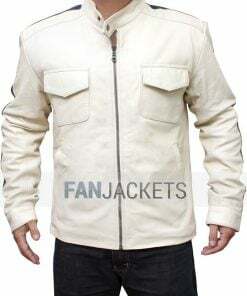 It can also be worn on trips, parties or even as an auto racer jacket.